Smitten: Serendipity Stamps Blog Hop!! So I played with this month's Stamp of the Month..... Simple Flower Cling Set- 50% off!! So I made a set of note cards. These are 4.25 x 4.25. I die cut a panel slightly smaller than the card base, die cut the center with a stitched outline for a little something, stamped the sentiments, stamped the flowers and colored the images with copics. The stitched panel with the sentiment was layered on top with foam tape for a little dimension. Here's the link to the Words and Verse section at Serendipity Stamps.... there're so many great choices!! 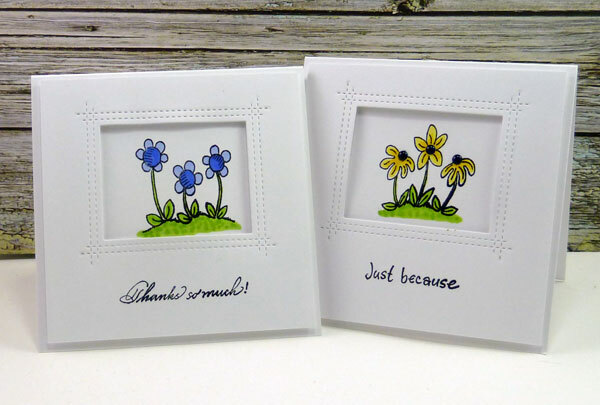 Your little notes, featuring the sweet flowers, are fabulous! 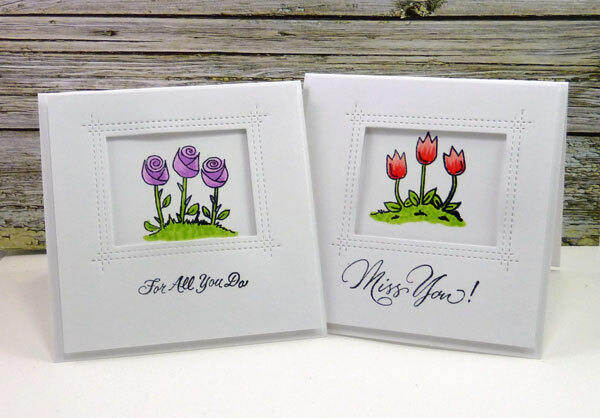 Love your set of cards with these cute flowers! Pretty coloring and a great look with the frame layer! Nice mix of sentiment stamps! So sweet with these flowers. I like the stitched frame. Absolutely adorable set of cards! LOVE these!